No matter how attractive brightly coloured modern cookware can look, there’s nothing that looks classier than a cast iron skillet hanging in the kitchen. Synonymous with serious cooking, cast iron cookware looks reassuringly heavyweight and cared for properly, can last for an entire lifetime. Cast iron casserole sets darken with age which unlike other types of cookware, can actually improve their performance. Picking a cast iron casserole set is not like buying cookware made of other materials so what kind of things should be considered? Cast iron has been used to make cookware for decades and has a durability which is unbeatable. Heavy in weight, cast iron pots and pans are almost impossible to dent and difficult to scratch, making them a good choice for the accident prone cook. They also provide excellent heat distribution, allowing food to cook evenly at much lower temperatures. Because of its resilience, cast iron cookware can be used both on the stovetop and in the oven, making it easy to transfer from one to the other. Cast iron is the original non-stick cookware but shouldn’t be treated the same way as modern dishes. In fact, it benefits from a coating of oil from time to time – something you would normally try to wipe off a pan! Cast iron cookware actually improves with age if it is well treated, and the dark black colour it turns is not a sign that it is past its life-cycle, but an indication that it is performing exactly as it should. It is possible to purchase either used or new cast iron sets but care needs to be taken over the quality of the metal. Avoid any pans which appear to have discoloured patches and make sure that the surface has not been artificially blackened with paint. The best pans will be evenly coloured, especially when new, and have a finely grained appearance and texture. Do not expect the surface to be silky smooth like Teflon, a rough feel is entirely natural because of the way in which cast iron is made. Cast iron cookware is very different to other types of pots and pans that you may be used to and despite its heavyweight appearance, needs careful handling in some ways. One of the reasons which cast iron cooks to evenly is the ‘seasoning’ on the surface, which is what occurs naturally over time as the dish or pan is used. Sticking cast iron in a dishwasher can destroy the seasoning, as can harsh soaps. The best way to clean a cast iron casserole set is to simply fill it with hot water after use and gently scrape with a plastic cleaning utensil after it has been allowed to soak. Cast iron has the potential to rust if left damp for prolonged periods so a thorough drying off is a good idea. 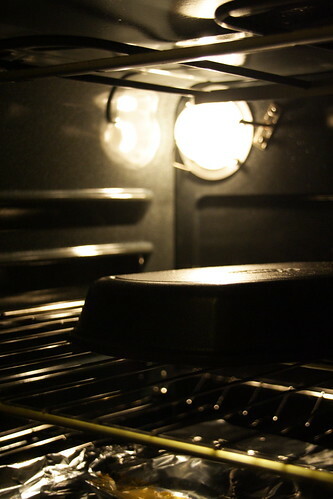 It is also possible to dry a cast iron dish by placing it in a gently warmed oven. Keeping the lid on the pan or casserole dish in the cupboard can also encourage rusting as air cannot flow freely. Putting a paper towel between the pan and its lid can help to discourage any rust forming. Finally, although cast iron will cook any food evenly and well, acidic ingredients are not a good idea. This is because the food can cause the seasoning to break down and the cast iron can give the dish a nasty metallic flavour. Any acidic foods – such as tomatoes – should only be kept for a very short time in the cast iron pot, if at all. You can put a cast iron dish back in the oven to dry it – this is also a good way of developing the seasoning. Cast iron casserole sets are a class apart but there is a skill in knowing how to look after them to get the best results. But with a little care and attention, and a new way of thinking, your cast iron casserole set could see you right into your retirement! Try buying the Sarpeaneva casserole dish for a special treat.